There's something about a DJ set with live instrumentation that just gets you. 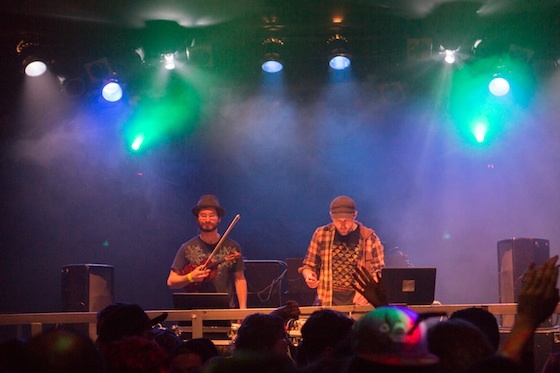 Emancipator (aka Doug Appling) shared the stage last night with classical violinist Ilya Goldberg, playing to a swelled crowd at Victoria's Sugar Nightclub. Goldberg, to his credit, provided the charm and acted as the perfect accompaniment to the Portland-based DJ, playing simply, without frills, atop base recordings. By the second track, Goldberg owned the set and was able to lull the already subdued crowd with his melancholic strings. For those unfamiliar, Emancipator can be described as Bonobo-like, with a spattering of Thievery Corporation thrown in, evident especially in his live performances — and the comparisons are meant in the best way possible, as he creates beautiful, ambient soundscapes while employing strings whenever he can. Appling played a decent mix from his three full-length albums, slowing it down four tracks in with "Soon It Will Be Cold Enough To Build Fires" before punching up the set with a more upbeat, house-laden track and stepping off the stage, leaving the floor to Goldberg. Not able to accompany, Goldberg sort of uncomfortably bopped around on stage, minimally tweaking a knob here and there to no effect before picking up his violin once again. Appling returned after a ten-minute absence and the ethereal, string-heavy tracks resumed with a sample of "Ready Or Not" by Fugees, softly underscored by violin. What became evident pretty quickly though, was how little Appling was actually doing onstage. The set seemed pre-mixed, with Appling turning a knob on occasion or tapping a drum pad, but it became painfully obvious after he left the stage a second time, again leaving Goldberg to sway solo through a handful of house tracks, lightly touching a knob every so often, hardly altering the tunes. Appling's departures were a bit odd, leaving the crowd to think Goldberg was suddenly running the show when he in fact looked a bit lost in front of the two-laptop setup, scrolling across the screens or tapping a key before stepping back, only to quickly approach again and place a finger on a knob. One can only imagine how standing on stage in front of a crowd while the music plays for you and your hands need something to do could be, well, awkward. Behind him, Victoria-based DJ AppleCat was setting up in Emancipator's absence, preparing for her own set. Despite the disappearing act and questionable mixing though, Emancipator's set was engaging, pulling from all his albums and incorporating a handful of samples and remixes, including "All We Need" by Odesza, which easily riled the crowd from its tranquil swaying and engaged them. If the audience had any qualms about Emancipator's performance, they didn't let on.